Westbourne Beach - The Best in Bournemouth? Westbourne Beach – The Best in Bournemouth? The Bournemouth area started to become popular as a seaside resort in the early 1800s. A retired army officer, Lewis Tregonwell, purchased some land in 1812, and began building some “sea villas” to let them out – the original holiday lets! He also started planting the pine trees for which the area has become famous, creating sheltered “invalid walks” to access the beaches. Westbourne beaches also have these wonderful walks through the chines. On a hot summers day, the shade can be extremely welcome.The Bournemouth area is, of course, famous for its sandy beaches. In recent times, the council has responded to the effects of nature by reclaiming sand from the sea, and pumping it back on to the beaches. Whilst initially this sand looks grey, it soon clears to become the golden sands we expect. Westbourne lies on part of the beach in the Bournemouth bay, which extends from Hengistbury Head around to Studland and the Old Harry Rocks. This gives the area its own “micro climate” – the warmth of the water warming the land. But why might the beach at Westbourne be any better than the rest? Its position on the bay means it is almost south-facing, thus enjoying the best of the sun. However, Westbourne beach has another major benefit. It is away from the piers of Bournemouth and Boscombe, which is the most popular area. Therefore, it is less crowded, making it more exclusive. However, it is not short of facilities. 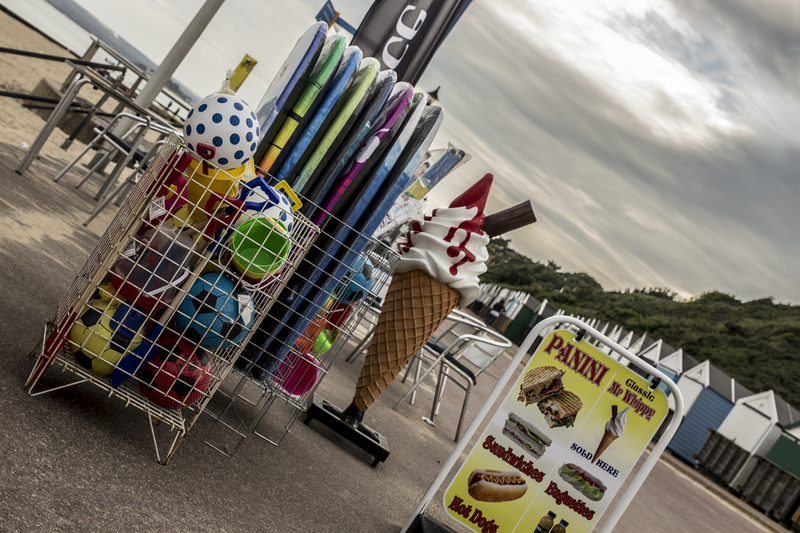 There a plenty of beach huts, water taps for washing the sand off, seats on the promenade, handy kiosks for supplies and ice cream – and an Italian restaurant! Just either side of the Westbourne beach at Durley Chine and Branksome Chine are more restaurants. Above all, there are the superb views to enjoy. Old Harry Rocks to the West, and Hengistbury Head to the East. The Isle of Wight can be easily seen on a clear day. Watch carefully, and you can watch cross-Channel ferries making their way to or from Poole Harbour.